I made deep fried ravioli for my Deep Fried Food Party and for my latest clothing exchange party. This has been sitting in my “to try” pile for years now, so I was very happy to finally make it. I compared a milk wash to an egg wash and I compared a bread crumb coating to a corn meal coating. I didn’t notice a significant difference between the milk and egg washes. For the coating, I preferred the bread crumbs, because it gave the ravioli a nice brown colour. Also, bread crumbs coat the ravioli more lightly than cornmeal, so the ravioli maintain their slightly chewy texture. Note: A 700 g package will serve 10 to 15 people; you could easily halve this recipe. Pour the milk into a bowl. In a separate bowl, mix the bread crumbs, salt, pepper, and garlic powder and dried parsley if using. Working with one piece at a time, coat the ravioli completely with a thin layer of milk. Allow the excess to drip off. Then coat the ravioli in the bread crumb mixture. Let the ravioli rest on a baking sheet lined with wax paper or a silpat mat. Repeat until you have coated the rest of the ravioli. Allowing the ravioli to sit for a few minutes while you heat the oil helps the coating stick to the ravioli. 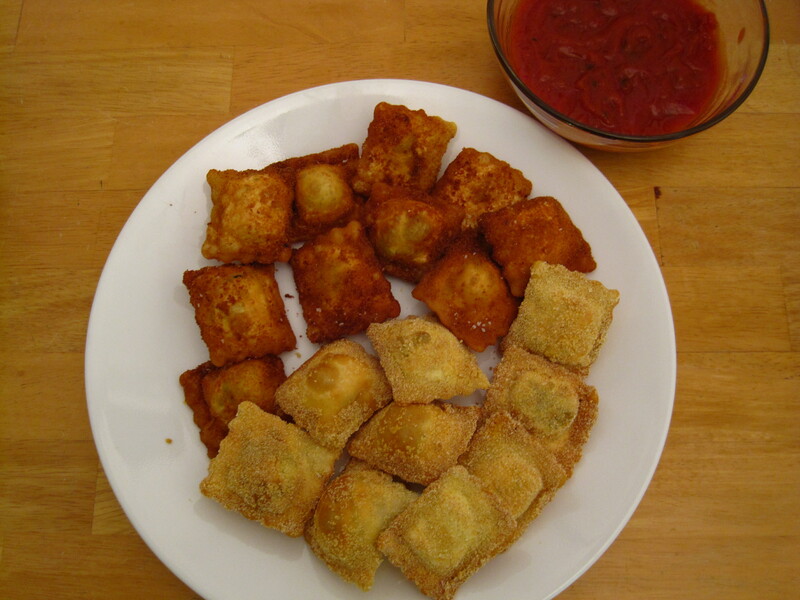 Preheat the oven to 200 F. Using a deep fryer or a wok or large pot, heat the oil over medium heat until it reaches 325 degrees F. When the oil is ready, fry the ravioli in small batches, turning once, until they are golden brown and crunchy, about 3 minutes in total. Using a slotted spoon (I use a Chinese wire strainer), transfer the fried ravioli to a paper bag lined baking sheet or large plate. Note: I use brown paper bags because I find that paper towel can make deep fried foods soggy. Keep the ravioli warm in the oven until you have finished frying all of them. Serve hot with a bowl of heated pasta sauce for dipping. Thanks so much for your comment! I hope you like it as much as we did!